New property measures to affect property transaction activities. Cut FY18F and FY19F private transaction values; expect 5% decline in FY18F and flat for FY19F. Earnings slashed by 23% for FY18F and 33% for FY19F. Downgrade to FULLY VALUED; Target Price cut to S$0.66. The government has reinstated property curbs through raising Additional Buyer’s Stamp Duty (ABSD) rates by 5ppts and tightened Loan-to-Value (LTV) limits by 5ppts. These measures will raise the cost of ownership. We expect demand from potential buyers to cool in the immediate term. Developers would also have to re-look at their pricing and launch strategy. We cut FY18F and FY19F private transaction value growth to -5% and flat for FY19F. As such, earnings are slashed by 23% for FY18F and 33% for FY19F. The uncertainty and expected slowdown in sales velocity in 2H18 and potentially 2019 might lead to developers re-thinking their land-banking strategy or even put a halt to this altogether. The en-bloc market could potentially grind to a halt. We have cut our FY18F and FY19F private transaction value assumptions, and now expect values to drop 5% in FY18F and stay flat for FY19F, from +15% and +10% respectively in the private residential segment. For HDB, we assumed flat growth, down from +10% and +5%. Downgrade to Fully Valued; Target Price reduced to S$0.66. Our Target Price is now based on PE valuation method, instead of the blended PE and DCF method, to reflect the volatile market in view of the policy changes. Pegged to 10x FY18F earnings, down from 15x previously, our Target Price is now reduced to S$0.66 (Prev S$1.22). We are expecting transaction values to hit S$43.1bn in FY18F (-5% y-o-y) and FY19F (flat y-o-y) for the total private residential market, including both primary and secondary markets. We expect the new property cooling measures to affect market transactions. For the HDB segment, we expect flat growth in FY18-19F, down from +10% and +5%. ERA’s market share based on transaction value increased from 26.9% in 2011 to about 38% in 1Q18. ERA has established itself as one of the market leaders in project marketing, alongside Huttons whose strength is in mass market projects, and Savills and Knight Frank which are both strong in luxury developments. In terms of project launches, ERA secured 12 projects out of 19 (47%) in 2015; 14 out of 23 (66%) in 2016 and eight projects or 91% of projects launched in 2017. To date, ERA has already secured 21 projects to be launched in 2018 with about 11,343 residential units available for sale. This is double the 4,800 units (from eight projects) launched by ERA in 2017. APAC Realty is the second largest agency in terms of number of registered real estate agents. APAC's agents are its primary sales force through which units are transacted, and are not employees of the group. APAC has grown its network of agents over the years, and has managed to gain market share. As at April 2018, APAC has about 6,100 agents with a market share of around 21%, up from 16% in 2014. Technological initiative to enhance competitiveness. APAC Realty currently offers various tools such as mobile applications to its agents and customers to facilitate the execution of real estate transactions. It intends to continue to develop its technological capabilities to enhance its competitiveness. It has launched a new Property Investment Calculator in its i-ERA mobile app, which will provide salespersons with a one-stop financial analysis tool for any property. They will be able to assist their clients to make more effective buying and selling decisions as all variables are dynamically updated. Cash-generative business. Barring any major capital expenditure, APAC Realty is a cash-generating business with good cash conversion cycle as APAC Realty only pays out to its agents after receiving payments from its debtors. As at 31 March 2018, APAC Realty had fully pared down its debt, with cash balance of S$63.5m. Intangibles, include goodwill and franchise rights, account for the bulk of total assets. Goodwill amounted to S$100m as at March 2018, derived from ERA Realty Network Pte Ltd, ERA Singapore Pte Ltd, Realty International Associates Pte Ltd and Coldwell Banker Real Estate (S) Pte Ltd. Franchise rights are held for the exclusive right of use of the brand names “ERA” and “Coldwell Banker”. The group acquired the exclusive ERA Regional master franchise rights for certain countries in the Asia-Pacific region for an initial term of 30 years from 19 November 1999 and expiring in 2029, with the option to renew for another 30 years. The group also holds the ERA sub- franchise rights in Singapore for an initial term of 30 years from 28 June 1990, which expires in 2020, also with the option to renew for another 30 years. We believe that APAC Realty is largely viewed by the market as a proxy to Singapore’s private and HDB residential transaction volumes and values. 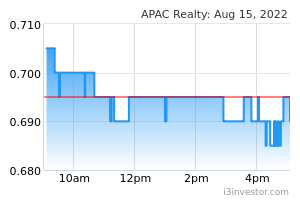 As such, any newsflow in relation to the Singapore residential market would have an impact on APAC Realty’s share price. APAC Realty is highly dependent on Singapore’s residential property market and macroeconomic conditions. Any change in government policies might affect the property market, which will in turn affect APAC Realty. For example, residential transaction volumes and values suffered a sharp decline in 2014 due to the cumulative effect of various measures introduced by the government. In the longer term, the real estate brokerage industry may also be disrupted by technology with increasing adoption of websites that facilitate private sales.